Pretty much everyone who visits Hawaii hopes to see the elusive – and endangered – honu (Hawaiian green sea turtle). Lucky scuba divers and snorkelers sometimes spot them in the waters of Turtle Bay, Lanikai Beach, and Hanauma Bay. 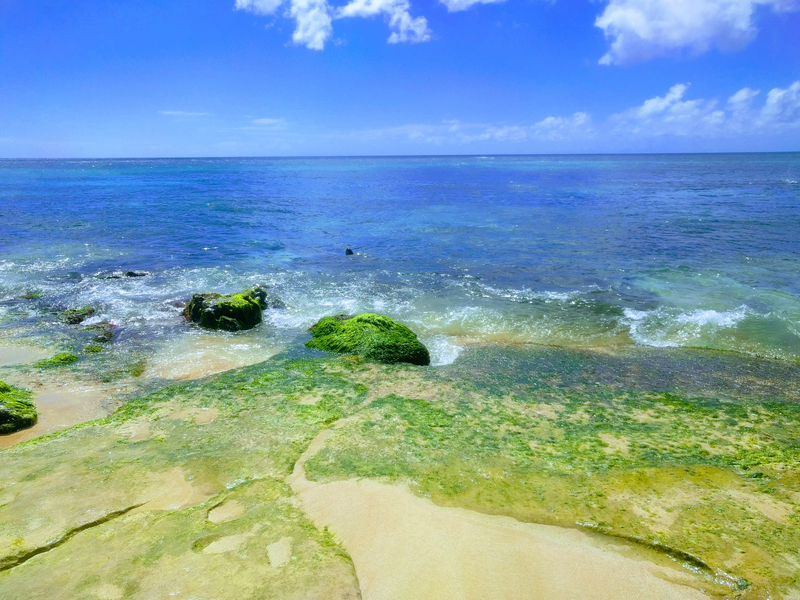 But there is one place that almost never disappoints, whether you are swimming in the ocean or watching from land: Laniakea Beach on Oahu’s north shore. Don’t confuse Turtle Bay with Laniakea Beach. Turtle Bay is a resort on the north shore of Oahu. Sometimes you can see turtles there. 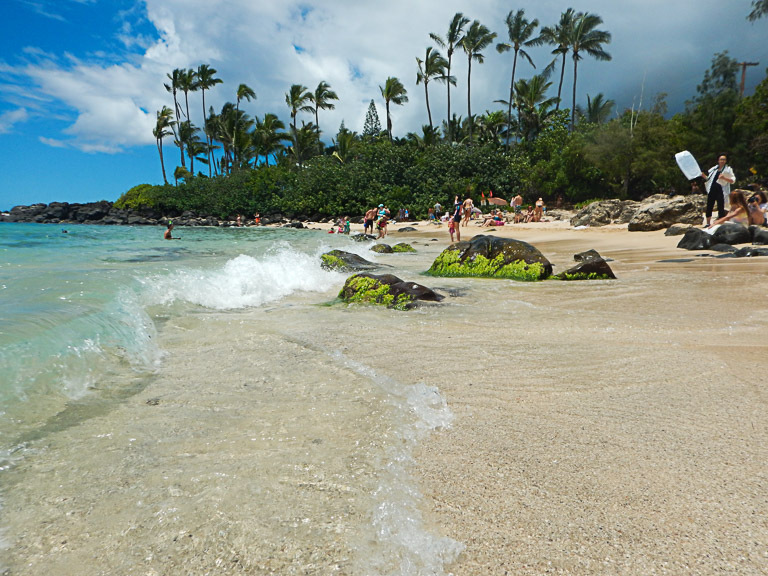 But Laniakea Beach, also known as Turtle Beach, is where the turtles really like to go to rest. It's usually easy to spot turtles at Laniakea Beach! Put Laniakea Beach into Google Maps, and Google will get you there. Parking is best along the Mauka side of the road (the side of the road closer to the mountains). Look for the white fences and park in the dirt along the side. If you are lucky, you might see horses behind those fences. Crossing the street is difficult here. There is no crosswalk, so you have to wait for the cars to stop for you. It is a very popular tourist spot, so there will be a lot of other people crossing the street too. Just be careful while crossing. When you get onto the beach, walk to your right. Walk the way down to the end of the beach. You will have to walk a little ways down to see the turtles. 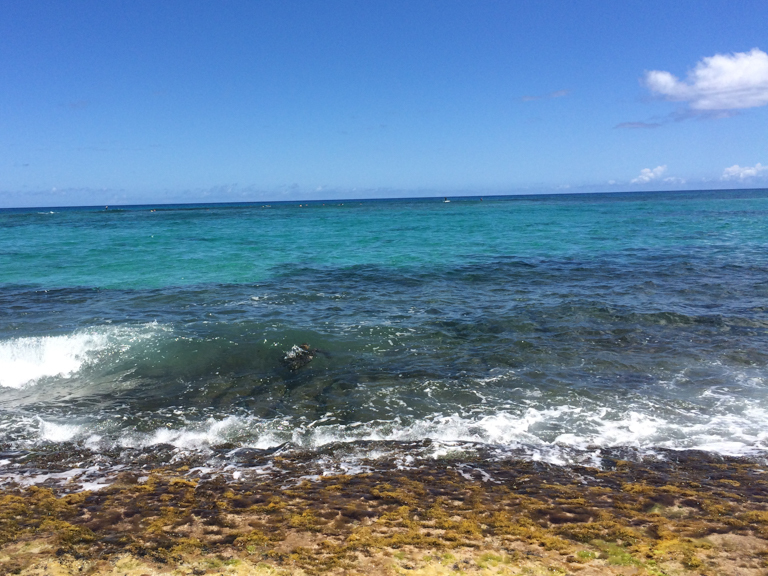 This spot on Laniakea Beach is the perfect area to see turtles and to swim. Throughout the day, Honu Guardian volunteers with Malama na Honu take shifts watching the sea turtles. The volunteers perform a number of important tasks to protect the turtles. Malala na Honu’s mission is to protect the Hawaiian sea turtles through education, public awareness, and conservation in the Spirit of Aloha. It came about as successor organization to the”Show Turtles Aloha” campaign, started by the National Oceanic and Atmospheric Administration’s Marine Turtle Research Program. Honu Guardian volunteers identify known turtles, track how long turtles come out of the water and when they go back into the water, and photograph turtles that haven’t been identified yet. In order to keep the turtles safe while they are resting on the beach, volunteers also put warning signs out and sometimes rope off the turtles so that visitors don’t accidentally get too close. They will be on watch to make sure that no one bothers the sea turtles. Oftentimes, people just don’t know the laws, but since you read Hawaii Aloha Travel’s blog, you will be one step ahead of the other tourists! Honua Guardians have a vital role in protecting sea turtles, and they are very knowledgable about them. Education is one of their main goals, and they love to talk to visitors. Feel free to go up to them and ask them anything about turtles! The best time to see turtles on Laniakea Beach is from 11:00 am – 1:00 pm. A Honu Guardian told me that! I made the mistake of going at 9:00 am. She was already set up and waiting for the turtles, but she told me that the best chances of seeing turtles are at lunchtime. 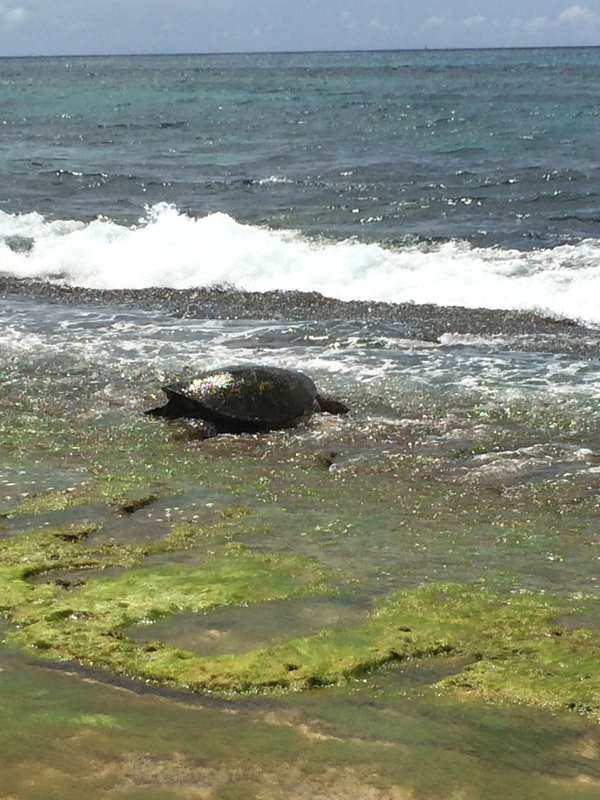 Keep your cameras ready and your eyes peeled for turtles popping out of the water at Laniakea Beach. Bring a camera! This is a once-in-a-lifetime opportunity that you won’t want to miss. There is not a lot of shade on this beach. However, if you bring your beach gear, it’s a great place to spend a few hours. Look at the turtles, swim around, and hang out on this pristine beach. Note that there are no restrooms at this beach. The rocks are not good entry points from swimming. Plus, that’s where all of the turtles are, so it can be difficult to stay away from them there. If you walk all the way down to the end of the beach, where the volunteers set up their chairs and where there are more trees, there is a sandy entrance to the water. Be careful if you go swimming. If a turtle comes near you, swim away. Remember to observe turtles only from a distance – at least 10 feet away. Never to touch them. For more tips on keeping our sea turtles safe, click here. Lanikai Beach is a great way to spend a few hours on the north shore. Laniakea Beach is becoming more popular, but there are a number of hidden places like this that we visit on our Oahu Circle Island Tour. If you want to experience all that Hawaii has to offer, call us to book our Oahu Circle Island Tour. After living on Oahu for many years, we have perfected a route that hits the best stops. But, we also customize it depending on what our guests want to see. If there is something on your Hawaii bucket list, let us know! Frequent stops on this tour include Iolani Palace, Downtown Honolulu, Haleiwa, Wailua Coffee Farm, Haleiwa Town, Alii Beach to see turtles, and Kawela Bay. You may also visit the Banzai Pipeline, Sunset Beach, and Waimea Bay, where the huge waves are a sight to see during the winter months. Based on your interests, we can also visit the Mac Nut Farm, Shark’s Cove, and Aloha General Shave Ice. Of course, along the way, you will get some of the best local comfort food Hawaii has to offer, including malasadas, coco puffs, spam musubi, and manapua! Click here for more information about this tour. Call us today to reserve a spot on our Oahu Circle Island Tour and let us know what you are interested in seeing! We are a local travel agency that is proud to put a personal touch on each tour.